The Single width Bakki Shower is 1000 mm long x 410 mm wide x 1100 mm high and with 50 kg of BHM are good for koi ponds of 2500 gallons, if used as the sole filtration, with 80 kg of BHM then good for ponds up to 4000 gallons. 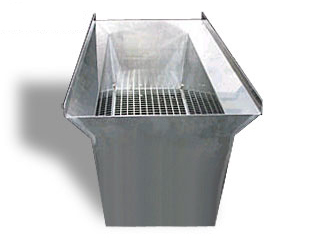 The Standard Bakki Shower Systems have an open square mesh bottom, however the Bakki Showers are offered with various weir or chute options being available as an extra. The Double width Bakki Shower is 1000 mm long x 610 mm wide x 1100 mm high and with 100 kg of BHM are good for koi ponds of 4000 gallons, if used as the sole filtration, with 160 kg BHM then good for ponds up to 8000 gallons. Again the Standard Bakki Shower Systems have an open square mesh bottom, for those customers wanting the water to fall straight through the 4 Tiers, however as with the Single Width Bakki Shower, various weir or chute options are available as an extra. All of our Bakki Shower Systems have an open square mesh bottom. 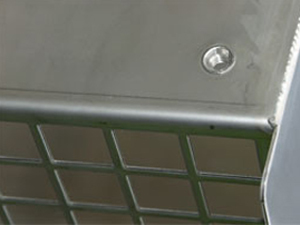 These Bakki Showers are stamped out by computerised machinery, in such a way that the sides of the Bakki Shower are integrated with the mesh, making them much stronger than they would be with a welded mesh. Bakki Showers are also fuse welded so that no metal is added to the welds. It is the computer cutting of the steel that results in the edges to be so accurately cut, that fuse welding is possible. The welds won't rust like conventional stainless welds. Also, the nuts that are used to attach the support brackets, are pressed, not welded. We have paid great attention to detail with Bakki Shower systems, and spared no expense! We are happy to sell three tier Bakki Shower systems, but strongly recommend the use of four tiers, as it is essential that the water has the chance to increase in velocity between the four tiers. More tiers will give better results. We also strongly recommend sticking to the use of Bacteria House Media in these Bakki Showers. Other medias will work to a degree in certain aspects, but only Bacteria House Media will work if these systems are used as the sole filtration. The overall flaring of each tier of the Bakki Shower ensures that no water is spilled by the system and also keeps the water tracking evenly through the Bacteria House Media. The flaring of the Bakki Shower systems makes sure that as the water runs off the outer extremities of the system, it is thrown back directly onto the Bacteria House Media in the next tier. There are endless options available for these systems, as well as bespoke units which can be made to suit your own application. Enclosure accessories are also available, for 'over-winter', or open air Bakki Shower applications. Bakki Showers and Bacteria House Media are patented Worldwide by Momotaro Koi Farm. Our Bakki Shower systems are the only ones made under license from Momotaro. Because of the sheer expense of Bacteria House Media, we are doing our utmost to keep the Bakki Shower prices to a bare minimum, so that the overall package represents excellent value for money. Bacteria House Media is the result of over six years of research. It is a man made ceramic blend that has been heat treated at 1300°c for 60hrs. This tremendous amount of heat causes the ceramic to break its internal bonds thereby creating an extremely porous structure that has a much greater surface area to allow very large bacteria populations to colonise. Due to the large quantities of tiny holes, mechanical filtration is also achieved using Bacteria House Media. Large organic solids and decaying matter are degraded at a far greater speed than conventional media, and without blocking up! One of the key elements of the Bacteria House Media is that it reacts in a seemingly 'electrostatic' manner with floating organic matter causing an increase in adhesion rate. This produces clear clean water at a rapid rate. Water in its natural state creates multiple bonds with surrounding water molecules creating a cluster. The Bacteria House Media emits FAR infrared rays that break the bonds of the neighbouring water molecules thereby allowing more oxygen to be dissolved in the water whilst falling throught he Bakki Shower. These Bakki Shower qualities using Bacteria House Media have been laregly attributed to springs unusual emissions of 'Far Infra-red' rays, which were first discovered by Nasa, and found to have important health benefits. The effect of the Bakki Shower using Bacteria House Media, coupled with the smaller water clusters, work very effectively at de-odourising the water, and also allows gases to be released, thereby lightening the load on the biomass, and making the systems considerably less 'KH consuming' than conventional filtration. Bacteria House Media is also extremely fast at colonising bacteria, very resistant to damage from power failures or chemicals, and very fast at 'bouncing' back after pond medications have taken place. The water produced by Bacteria House Media (even when submerged), is such that the Koi strongly favour swimming in the areas where the filtered water enters the pond. Appetites are also greatly increased using the Bakki Shower with Bacteria House Media.